A citizen-led initiative to educate and engage Jersey City stakeholders about green infrastructure benefits and inspire more projects across all of our neighborhoods. Sustainable JC believes that more Green Infrastructure in Jersey City will alleviate our exasperated problem of combined stormwater and sewage overflows, which are polluting the Hudson and Hackensack Rivers and our urban landscape. This is not only a community health issue. It is now estimated that the economic cost to taxpayers to remediate our dilapidated sewer system will be upwards of $55M, which doesn’t include the local above-ground damages experienced during flooding events to households and businesses. Green Infrastructure solutions can cut these costs by 50% or more. educate the community about low-cost green infrastructure options such as Rain Gardens and how they can help to prevent flooding. engage substantial community support for the initiative to show that this is a priority, which we hope will energize municipal officials to develop a long-term plan to integrate a full array of Green Infrastructure solutions in Jersey City. highlight how effective collaboration across organizations in JC and around the region can have a greater and longer lasting impact, engage wider participation and educate more people. use the Arts to reflect on the personal aspects of what sustains community members who live and work here and inspire a cultural shift that embraces transforming Jersey City into one of the most sustainable cities in our region. Sustainable JC has been planning this project for some time. We have been active over the last two years creating a dynamic collaboration amongst technical advisors, host sites, funding partners and building a local Project Team. Community education about the positive environmental and economic impacts Green Infrastructure can have has been ongoing, including our just-launched, groundbreaking Certificate Program in Urban Sustainability for Jersey City. Offered at Hudson Community College, the Certificate Program is intended to activate neighborhood stakeholder groups toward sustainability projects that can transform their neighborhoods. The only thing we have left to do is the installation of this first demonstration site at St. Paul's by the NJ Tree Foundation. This will be followed by more artist installations in and around the footprint to create awareness and enage more community members as we ramp up for the next project. To this end, we are including a start-up fund to pay artists for their time and materials as outlined in our budget. In 2011 Jersey City was levied with an EPA Consent Decree in for Violations of the Federal Clean Water Act, stemming from raw sewage being released into the Hackensack and Hudson Rivers as well as Newark Bay and Penhorn Creek. This Decree requires the city to address the issue within eight years. The release of untreated sewage into waterways results in an increase in water-borne illnesses, reduced recreation abilities and environmental crises. Rain Gardens are a low-cost infrastructure method that allow rainwater and snowmelt to be collected and seep naturally into the ground. This prevents polluted runoff and sewer overflows, thereby reducing both environmental and public health impacts on the city. 1. NJ Tree Foundation excavation and installation ~30’x5’ rain garden - $2,200. 1 cubic yard compost, 2 cubic yards mulch, .5 tons 3-5” river rock, 50 Perennials/grasses. 2. Five Corners Eco-Village Public Art Installation Fund - $2,000. Saint Paul’s Center of Caring (501c3) will administer this seed fund which we plan to grow through additional fundraising strategies to pay artists who are working on this initiative for their time and material costs. Today is the last day for SJC's Rain Gardens +ART fundraising effort and we could use your support to put it over the top! The Dodge Matching Funds will double your donations so DON’T LEAVE THIS MONEY ON THE TABLE PLEASE! Just a few hundred dollars can make this first project a success. We’ve been working on SJC’s Rain Gardens +ART Campaign for some time and we are VERY grateful to the Geraldine R. Dodge Foundation for their support and insight into the way we are bringing awareness and education about Green Infrastructure to JC. Working with the artists who have partnered with us on this adventure has been a fabulous experience and there’s so much energy they are bringing to creating and sharing their work with the community—it’s really inspiring. We’ve put together a great collaborative group to make this multi-project Campaign happen over the long term and we really appreciate working with astute partners like St. Paul’s, who stepped up as the first host site and learning center for the community. Thanks to the NJ Tree Foundation, who will be doing all of our installations, and to the ioby.org staff who have been amazing partners on this—their platform is an awesome tool! Now all we need is YOU! Thanks for giving what you can. PS: If you want to suggest a Rain Garden site in your neighborhood, visit our website and scroll down to the highlighted form. FLASH Funding Weekend!! From now until this $1,000 pot runs dry, the Geraldine R. Dodge Foundation will match every donation dollar for dollar, up to $50. Turn $25 into $50!! Laurie Riccadonna, Associate Professor of Fine Art at Hudson County Community College, Installs a Rain Garden On Her Front Lawn!! The holidays are approaching and we know this time of year is calling your attention to all sorts of commitments but we hope you can hang in there with us for just one more week! We’re in the home stretch of the campaign and have already raised enough money for the NJ Tree Foundation to install a Rain Garden up at St. Paul’s and to provide the community education needed so the Rain Garden thrives. The other important part of this campaign is to raise enough money to pay artists for their work in helping to revitalize the Five Corners Neighborhood. The arts play a very important role in both education and building community and SJC has welcomed their partnership on this project. Quality of life matters and it’s an important cultural reflection when artists work are a part of making a place better. 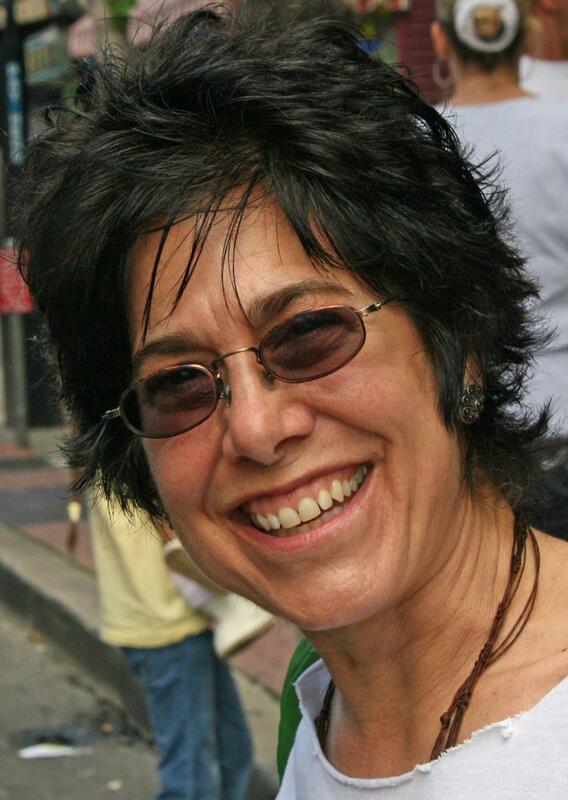 Here we introduce Laurie Riccadonna, who is one of the fabulous women helping to curate the +ART piece of our Dodge Planning Grant Award. 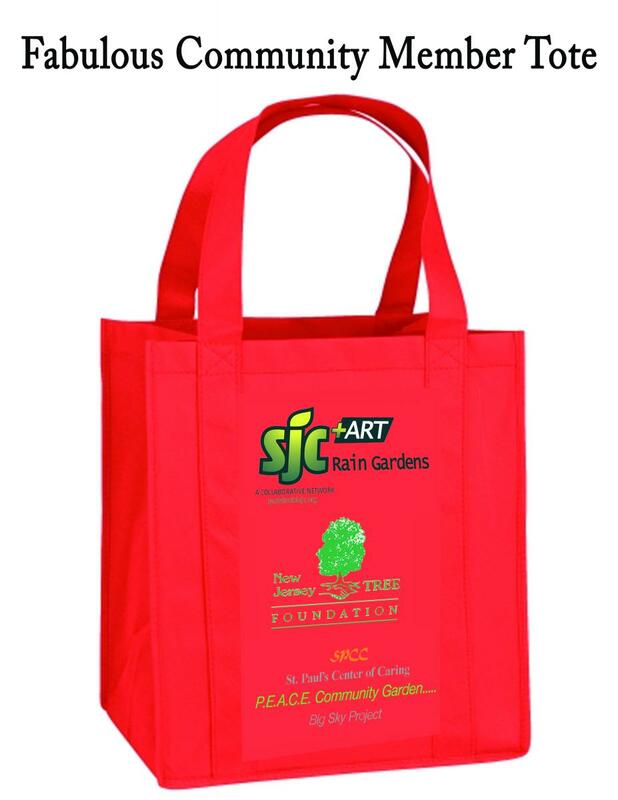 For more information and to donate to the campaign, please visit our ioby site at https://www.ioby.org/project/sjcs-rain-gardens-art-campaign. I became a participant in Sustainable Jersey City for a variety of reasons both personal and professional. As an art professional and an artist, I am interested in the role that the arts play in the array of activities that SJC sponsors. As one of the curators of their Rain Gardens +ART project, I am able to utilize my experience in art and curate exhibitions that explore issues involving the environment and community. As a thirteen year resident of Jersey City, I have been very much aware of the flooding that poses a significant risk to many residents of the city. With our current home we discovered that the downspout on our roof drained stormwater right next to the foundation of our house, which sometimes would leak into our basement. Since installing a rain garden and rain barrel we have not had any issues with water in our basement. The garden has beautified our property and has eliminated this water from entering the already overburdened sewage system. Although this is just a very small step, my family tries to make the environment around Jersey City more sustainable for our children and future generations. Councilman Boggiano announces support for Rain Gardens +ART Campaign! Happy Tuesday from SJC! We hope you all had a wonderful Veterans Day yesterday. As we come into the third week of our Rain Gardens + ART Campaign we have almost hit the 50% mark! We’re moving along but there are only two weeks left in the campaign to achieve the funds needed to install this wonderful Rain Garden at St. Paul’s. We want to remind you that all donations are 100% charitable deductions and that all neighborhoods are affected by overflooding, not just those in low-lying areas. The community response is really exciting and we just need to push a little harder to make this campaign a full success, including the +ART component! We kindly ask that you share this email with as many people as possible so that we can accomplish our goal of bringing more Green Infrastructure to Jersey City! The Five Corners Neighborhood is in an exciting and rapidly developing area of Jersey City and we want to make sure that we nurture and demonstrate more sustainable practices of living and working as redevelopment happens. 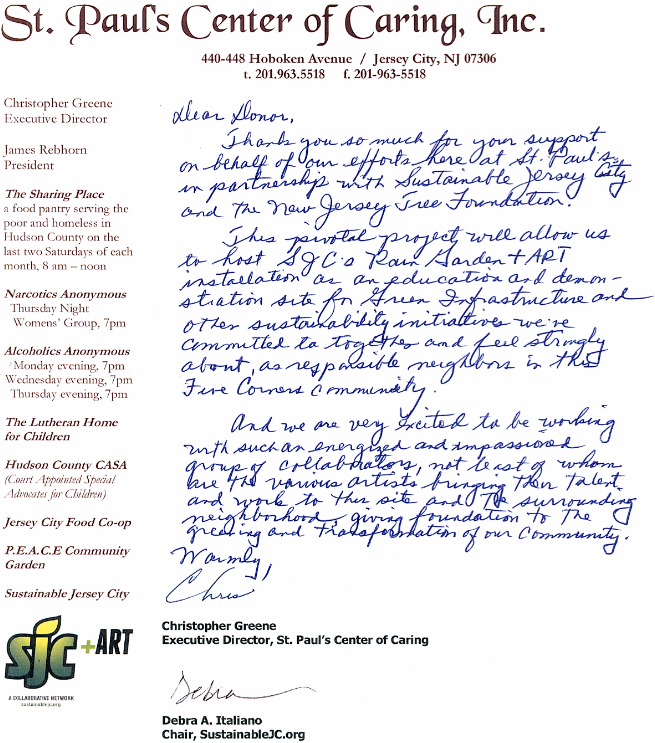 We’re happy to announce that Councilman Boggiano of Ward C has offered his support for this project and SJC’s other community outreach initiatives. “SJC is a great group. The work they are doing with outreach and education projects such as their Rain Gardens +ART Campaign and their Community Composting pilot program are invaluable to Jersey City. These efforts help bring diverse community members together and drive the sustainability planning necessary to address climate change challenges facing Jersey City. We’re over the moon about the response to the Rain Gardens +ART Campaign so far! In one week we have reached just about 30% of our total fundraising goal -- amazing! We also had a fantastic and extremely informative feature article written about the campaign in this weekend’s Hudson Reporter. You can check it out here. We thank you so much for the support! We at SJC believe that a sustainable community is composed of a multitude of different threads woven together. One of these important threads is Art. We would like to introduce you to Mollie Thonneson, a prominent local JC artist and one of SJC’s key supporters of this campaign. “For me sustainability means connecting with and giving back to my community through art. Partnering with the SJC Rain Gardens +ART Project has allowed me to make that connection. During numerous SJC events I have enjoyed helping people create beautiful group art while playing my game TAG. This has been such a rewarding experience for me because it allows me to break out of the solitude of my usual studio work. TAGtheArtGame is an interactive activity in which groups of people work together to create one piece of abstract art. Players take turns choosing random cards that dictate what, how, and where on the canvas or paper they will be making their marks. With many people taking turns the artwork becomes increasingly more complex with beautiful layers and depth. Rain Gardens +ART Campaign is off to a GREAT START! SJC’s Rain Gardens +ART Campaign is off to a wonderful start! In just a few days we have raised over $300 dollars to help fund the implementation of a rain garden at our first demonstration site- St. Paul’s Lutheran Church in Jersey City. We’re very excited about how the campaign is progressing and would like to thank everyone who has already donated! Please help us spread the word about the campaign and support green infrastructure, local artists, and community building. Remember, these gardens help protect us all! 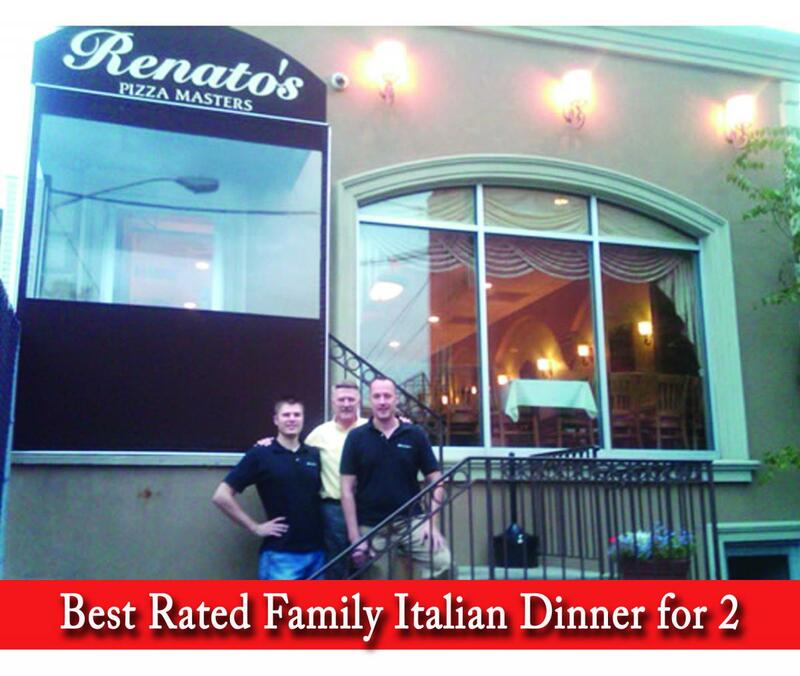 As the campaign progresses we invite you to celebrate with us and our supporters. Each week we will be featuring a key supporter in this project. This week it’s Pastor Jess of St. Paul’s Lutheran Church. Pastor Jess has been instrumental in the success of this project and we are very grateful to her for all of her hard work. 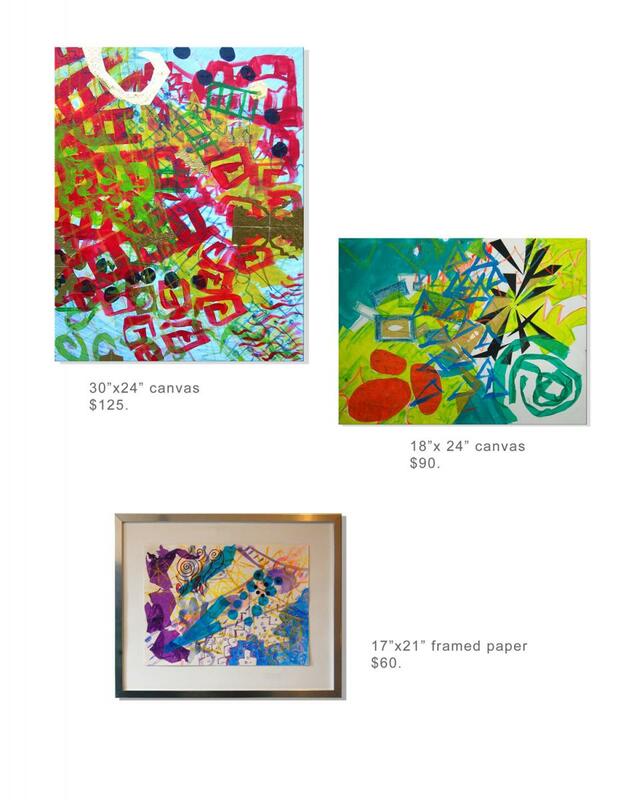 Also, be sure to check out our gifts for donating as seen on our ioby.org site! 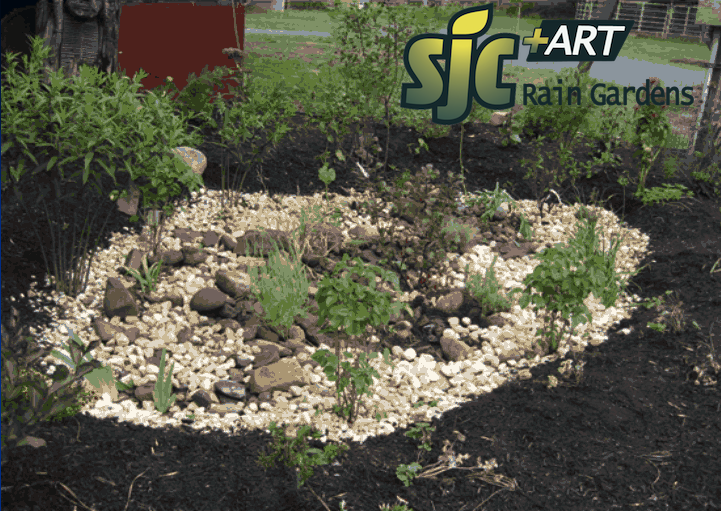 https://www.ioby.org/project/sjcs-rain-gardens-art-campaign. 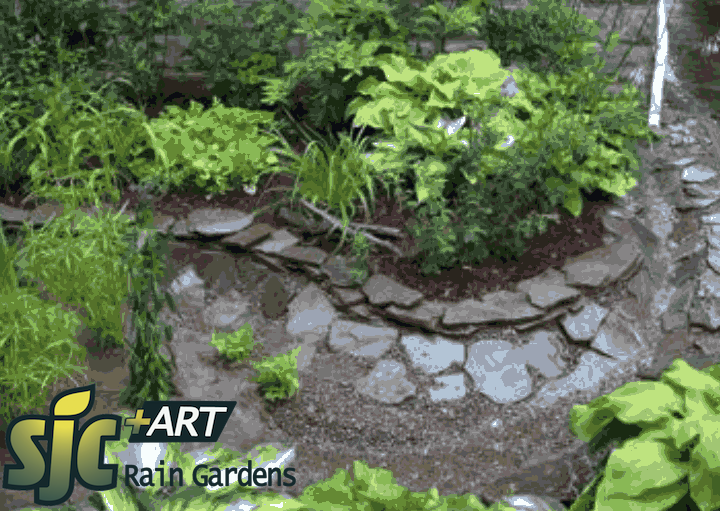 We are excited to announce the launch of our Rain Garden +ART campaign! As most of you may know, Jersey City has an aging sewer system. Because of the current condition of the system, overflows during rainstorms release sewage tainted stormwater into rivers and the urban landscape. Because of these overflows, Jersey City has been levied with an EPA Consent Decree for violations of the Federal Clean Water Act. We at SJC believe that more green infrastructure in Jersey City will alleviate this issue substantially and lower the estimated $54 million dollar tab to repair our sewer system by at least 50%. We also believe that we can educate and engage neighborhoods across the city about this community health issue through the Arts, and so have launched a citywide Rain Garden + ART campaign. 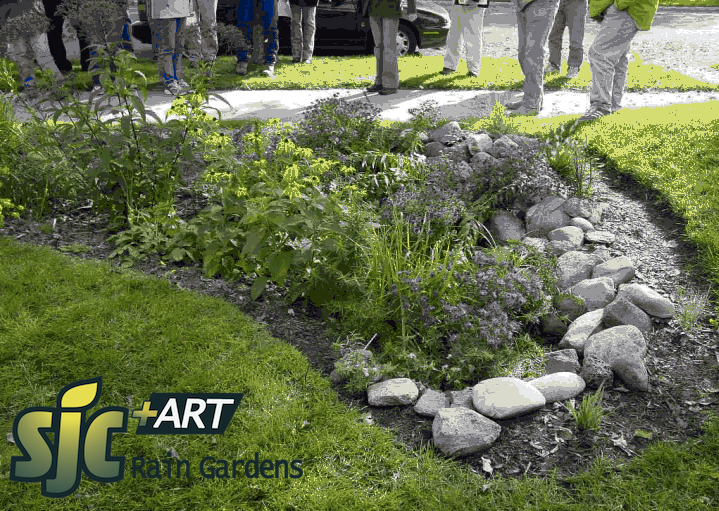 Rain gardens are a low-cost green infrastructure method that allow rainwater and snowmelt to be collected and seep naturally into the ground. They divert water away from sewers and thereby reduce the load and the amount of sewage released into the environment. In order to demonstrate their positive effects not only on the environment but also in the social realm by bringing community groups together, SJC has chosen an initial demonstration site of St. Paul’s Lutheran Church. In addition to providing an excellent cost-saving measure for the city, the gardens will provide beautification with native plants and companion art installations located in and around the site. Through our collaboration with community arts organizations, individual artists, the NJ Tree Foundation and our host site partners, SJC aims to show how connecting social, environmental and economic impacts can transform Jersey City into a more sustainable place to live and work. 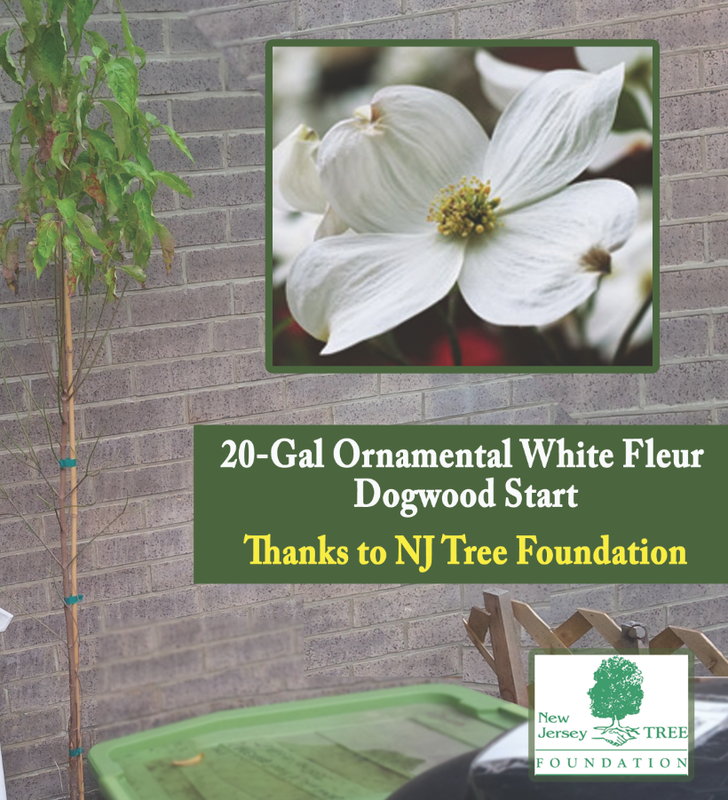 In order to fund and install these gardens, SJC has partnered with the Geraldine R. Dodge Foundation, the NJ Tree Foundation and the New York City based crowd-resourcing site, ioby.org. As a community-based organization, our goal is to integrate the community into the fundraising and implementation process as much as possible. The Dodge Foundation has generously awarded SJC with a grant to finance half of the project but we still need to raise the other half. We invite you to support us in this campaign and spread the word! For more information and to donate, our ioby site can be accessed at: https://www.ioby.org/project/sjcs-rain-gardens-art-campaign. Sustainable JC is growing and this project needs additional hands on deck. If interested in Volunteer opportunities that include participating on Committees, at Events or joining this or one of our other Project Teams, call Debra at 917-447-9839.